The temple is located on a hill with Lord Veerabadra facing north. 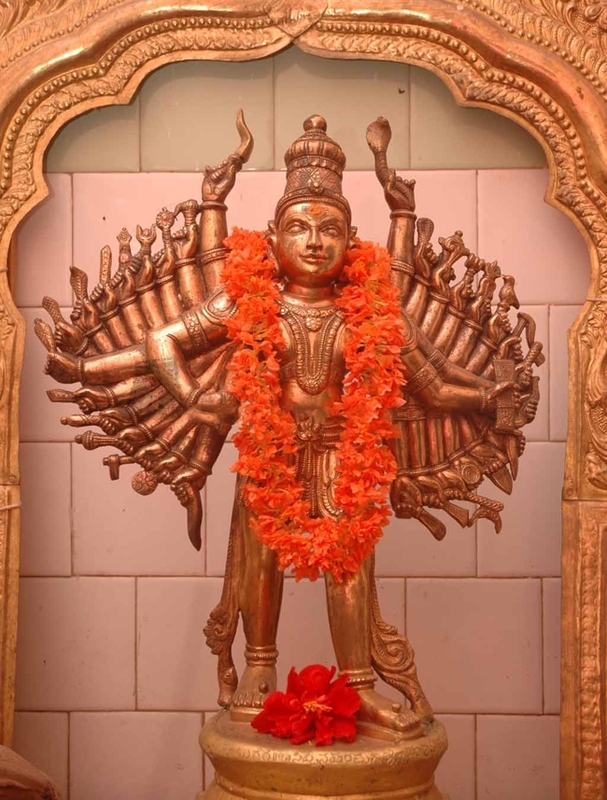 He has the Mazhu (an axe-like weapon) and the serpent as Lord Shiva and the trident, Bana as Ambika, discus and conch as Lord Vishnu and other weapons in His 32 hands. 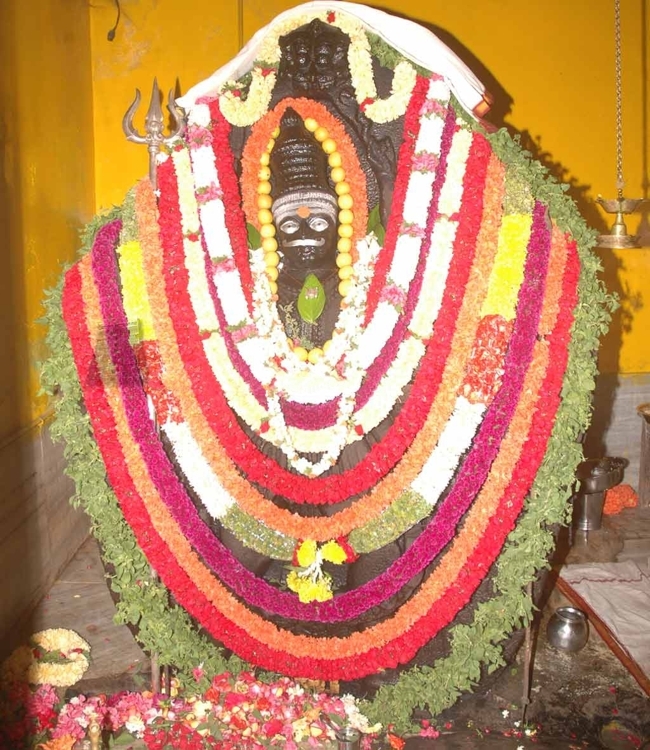 Nandhi is before His shrine. Procession deity too has 32 hands with Daksha and his wife Parsuddha Devi. Those concerned with the welfare of children and facing adverse aspects of snake planets pray to Lord Veerabadra for relief. The temple celebrates Aavani Mondays in August-September and Rathasaptami in January-February. Daksha, father of Mother Parvathi organized a yajna and failed to invite Lord Shiva his father-in-law intentionally. When Mother Parvathi questioned his arrogance, he humiliated his own daughter also. Lord Shiva sent Veerabadra to destroy the Yagna and also drove the Devas invited by Daksha to receive Havirbaga-the benefit of yajna. Remembering this event, a temple was built here with a Veerabadra idol with 32 hands. The temple went into ruins in the years followed. A king, Rayaraya Chola while passing through this place, found an object glittering among the bushes. Removing them, he found the idol with 32 hands, installed it here and built the temple again. Rudrabishekam is offered to Lord on Tuesdays. On the last Tuesday of Karthikai month – November-December, Alankara to Lord is done with coconut chips. As Lord Veerabadra appears in a furious form in this temple, this is applied to soften Him. 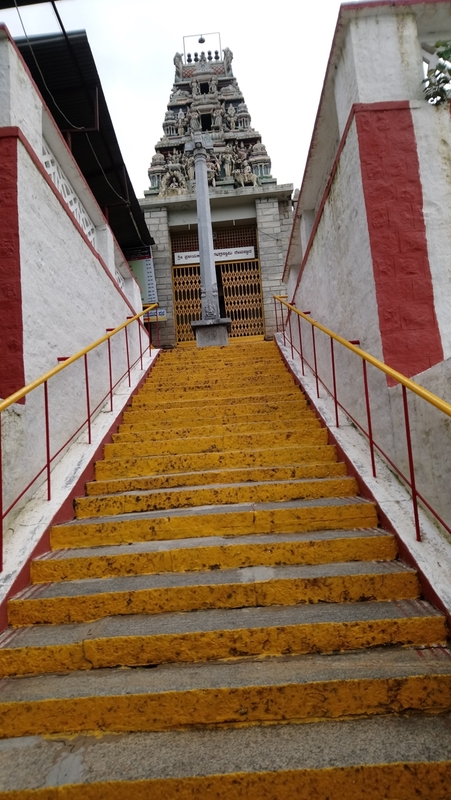 Sri Anjaneya appears on the right side of Lord’s shrine in the hill. He worshipped Veerabadra and has His darshan, according to legends. Lord Uma Maheswara with Mother Parvathi graces from the shrine left of Sri Veerabadra. Nandi Deva is holding His Feet. Lord Vinayaka and Lord Muruga are nearby in a worshipping form. There are also shrines for Muruga with His consorts Valli and Deivanai, Lord Mahalingam, Mother Parvathi and Lord Vinayaka. Sun appears on Rath drawn by seven horses in the Navagraha mandapa. It is festival in the temple on Mondays of Aavani month-August-September. Lord comes in procession on the last Sunday of this month on Pearl Palanquin. 3 day in Thai month Rathasapthami festival is celebrated in January-February. A fire pit (Pookuzhi) is made before the festival when two priests and a devotee dressed as Lord Veerabadra, take pieces of fire in their hands and place it on a plate. They put incense powder and show the Dhoop Arti to Lord and perform pujas. Then they (the three) walk on the fire pit. Special Rudrabisheka is performed on Lord on Rathasapthami day. Lord comes in car procession then. Realizing their wishes devotees offer garlands of Tulsi, Vilwa, Nagalinga flowers and lime and offer Boli – in some places this is known as Ubbuddu, Karnataka in particular – as nivedhana. 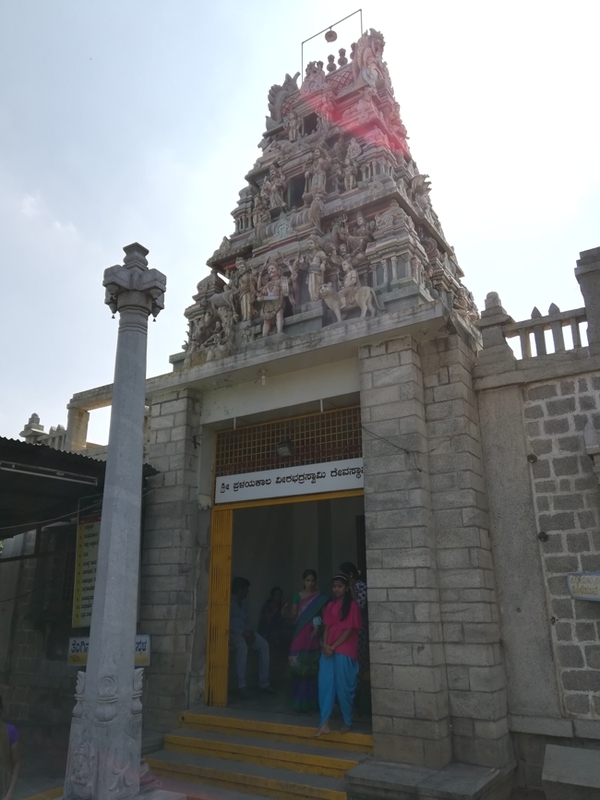 Sri Pralayakala Veerabadra swamy Temple is located in Bangalore Gavipuram Guddahalli, in Bangalore, Karnataka. 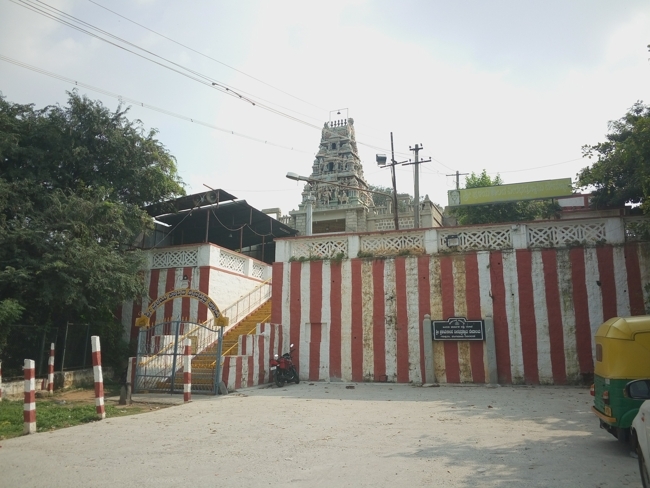 At present, the temple is managed by Sri Pralayakala Veerabadra Swami Devasthanam. Banashankari Stage I, Banashankari, Bengaluru.